Pet Wash Enclosure with Splash Guard Dogs title as Mans Best Friend has been around for almost 15,000 years. Currently, dogs are genuinely being treated like mans equal counterpart with their own specific clothes, yummy treats and even doggie hotels. Every dog-owner knows the energy consuming fiasco required with washing these furry pals in our kitchen sinks and bathtubs, along with the mess afterwards. For this reason, we have developed the Home Pet Spa that will not only make our life easier but your dogs more enjoyable. Easy to store in your garage, basement or laundry room, you can now keep your dog clean in the comfort of your own home without worrying about the groomer or the cleanliness of your home. Our unique design offers your dog a relaxing experience in our special dog wash with its strategically positioned jets and massagers, while you give your soapy furry friend the bath he needs with little effort. 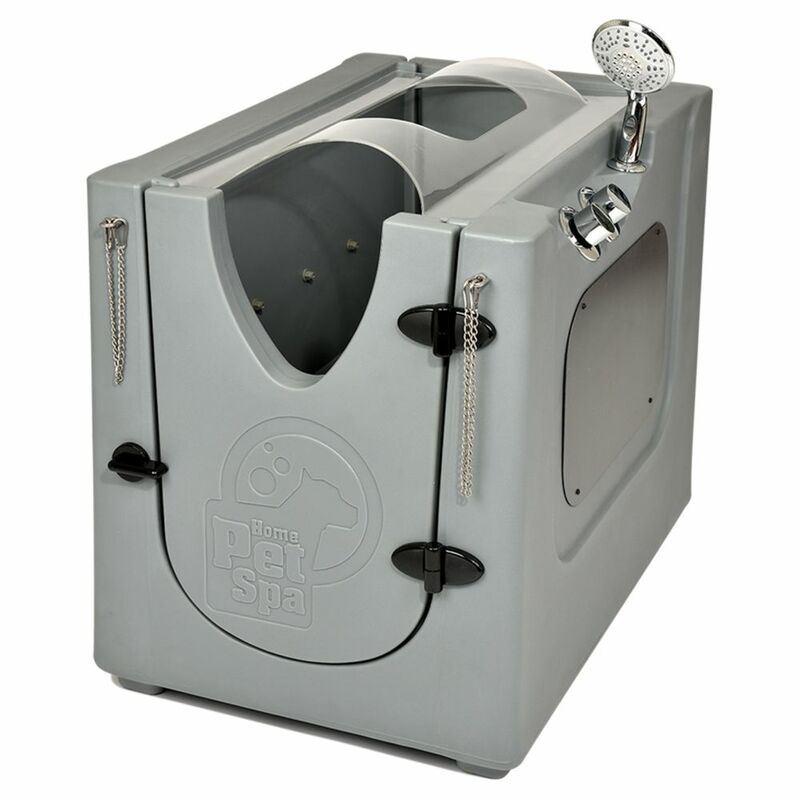 Pet Wash Enclosure with Splash Guard is rated 5.0 out of 5 by 1. Rated 5 out of 5 by Winniethe from The Pet Spa was delivered to Home Depot where I picked it up. The side panel plastic connectors h... The Pet Spa was delivered to Home Depot where I picked it up. The side panel plastic connectors had sheared off in transit, so the plumbing was exposed. I contacted the manufacturer about the broken connectors and they promptly sent me four replacement connectors. Even though the limited assembly instructions were vague, it was easy and logical to assemble. My dog was initially hesitant about entering the Spa, but he settled down once inside the Spa. The Pet Spa fit my German Shepard Dog and the "belly" sprays were very effective on the normally hard to reach belly dirt; the confining walls also help to keep him from moving around. The spray wand hose is long enough to reach anywhere on the dog and has a variety of spray configurations. The two plumbing controls are easy top reach; one controls the "belly" spray and the second controls the wand, which also has a shut off control. The water hose connection and discharge pipe are near the bottom on the opposite side from the controls, so you don't trip or step on them during the bath. The splash guard sounded useful, but was not very practical when working with a large dog. I would, however, recommend getting the wheels (I did not) as it is a little awkward moving it around my deck. Overall, I am very pleased with both the product and the manufacturer's customer service response. The few bumps I mentioned above do not diminish from the very practical and easy way this Pet Spa helps to give my dog a bath.